"Just two ingredients! This is foolproof and good every time!! 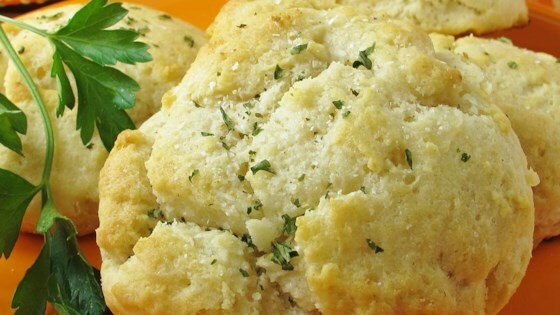 If you've ever enjoyed a famous chicken restaurant's biscuits, you've got to try these!" In a medium bowl, stir together the flour and cream just until blended. You should have a sticky dough. Use a large spoon to scrape the dough out onto a floured surface. Knead the dough once or twice, then pat or roll out to 1/2 inch thickness. Cut into circles using a biscuit cutter. Place on a baking sheet, spacing 1/2 inch apart. If you like drop biscuits, you can skip the this part and just drop spoonfuls of the dough onto a baking sheet. Bake in the preheated oven until the bottoms and tops are golden brown, about 15 minutes. See how to make quick-and-easy drop biscuits from scratch. You may also cut out the biscuits and then place them in a freezer bag. Freeze for later use. Baking will take an additional 5 to 10 minutes. Halved recipe. Made 1 c of self-rising flour by adding 1.5 t baking powder and .25 t salt to all-purpose flour. Easy!